Enhanced safety features help keep you protected from hackers, malware and scam websites. 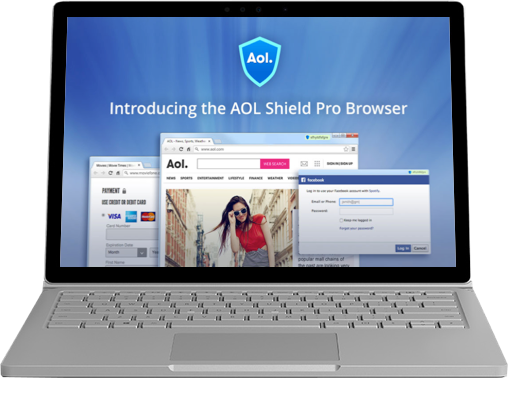 AOL Shield Pro provides protection for the things you do every day. Real-time encryption technology that hides what you enter on your keyboard from hackers. Stop malware from taking pictures of your monitor as you enter sensitive data. Don’t get tricked into revealing personal details from scam websites. Q: What is keylogging and how does AOL Shield Pro protect me from it? A: Keylogging is a technique used by hackers to covertly records what you type on your computer keyboard. When you use AOL Shield Pro, our patented technology replaces the actual keys you press with randomly-generated characters to help prevent hackers from stealing sensitive data, such as your credit card number or bank account password. Q: How does AOL Shield Pro protect my identity online? A: We scan the internet looking for hacking sites that are designed to steal your personal information like bank account logins and credit card numbers. If you unknowingly visit one of these sites using AOL Shield Pro, we will alert you to the threat. Q: Can I import bookmarks and settings from my other browsers? A: Yes, the process of migrating from your old browser to AOL Shield Pro is easy. Just open AOL Shield Pro and click the browser menu button (three dots) in the top right hand corner of the window. Next, scroll down to Bookmarks and then click Import bookmarks and settings. In the window that appears, select the browser that you'd like to import your bookmarks from, and then click Import. Q: Does AOL Shield Pro have "private" or "incognito" browsing? A: Yep. In the upper right, click the browser menu button (three dots), and then click "New Incognito Window". Once enabled, AOL Shield Pro will not store your browsing history or the sites you've visited. Q: Can I still use Chrome extensions with AOL Shield Pro? A: Yes, AOL Shield Pro supports most of your favorite Chrome extensions. We love them just as much as you do. A: Keylogging is a technique used by hackers to covertly records what you type on your computer keyboard. When you use AOL Shield Pro, our patented technology replaces the actual keys you press with randomly-generated characters to help prevent hackers from stealing sensitive data, such as your credit card number or bank account password. A: We scan the internet looking for hacking sites that are designed to steal your personal information like bank account logins and credit card numbers. If you unknowingly visit one of these sites using AOL Shield Pro, we will alert you to the threat. A: Yes, the process of migrating from your old browser to AOL Shield Pro is easy. Just open AOL Shield Pro and click the browser menu button (three horizontal lines) in the top right hand corner of the window. Next, scroll down to Bookmarks and then click Import bookmarks and settings. In the window that appears, select the browser that you'd like to import your bookmarks from, and then click Import. A: Yep. In the upper right, click the browser menu button (three horizontal lines), and then click “New Incognito Window”. Once enabled, AOL Shield Pro will not store your browsing history or the sites you’ve visited. A: Yes, AOL Shield Pro supports most of your favorite Chrome extensions. We love them just as much as you do. A: Keylogging is a technique used by hackers to covertly records what you type on your computer keyboard. When you use AOL Shield Pro, our patented technology replaces the actual keys you press with randomly-generated characters to help prevent hackers from stealing sensitive data, such as your credit card number or bank account password. A: We scan the internet looking for hacking sites that are designed to steal your personal information like bank account logins and credit card numbers. If you unknowingly visit one of these sites using AOL Shield Pro, we will alert you to the threat. A: Yes, the process of migrating from your old browser to AOL Shield Pro is easy. Just open AOL Shield Pro and click the browser menu button (three dots) in the top right hand corner of the window. Next, scroll down to Bookmarks and then click Import bookmarks and settings. In the window that appears, select the browser that you'd like to import your bookmarks from, and then click Import. A: Yep. In the upper right, click the browser menu button (three dots), and then click “New Incognito Window”. Once enabled, AOL Shield Pro will not store your browsing history or the sites you’ve visited. A: Yes, AOL Shield Pro supports most of your favorite Chrome extensions. We love them just as much as you do.